Every dog has it's dye. We're sending him to a trainer to sort out his behavioural problems. She says he's on the spectrum. "No, what I actually said was collar the dog"
When he calms down he becomes the Andrex puppy. 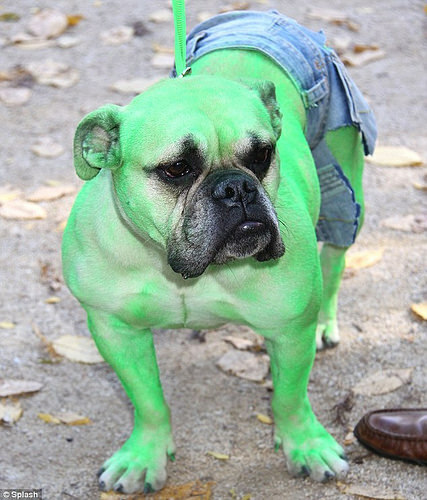 My dog Beryl was so naughty at dog fancy dress do in the park, they tried to Banner. Jack envied the other dogs. How come they got to wear Wranglers when he had to make do with Tesco No-Frills? "I told you not to stand near the elephant when it's got a cold"
They tried to Banner from Cruffs. "Your dog is simply marvelous!" I told you to not make him angry! "You'd have frown lines too if you'd been adopted by Lady Gaga!" Every year, you find some people ignoring vets' advice to keep their dogs away from water affected by blue green algae. Phil Mitchell was feeling decidedly ruff after a doggy curry. Bingo didn’t take coming second at Crufts too well. I think he looks incredible. After being accussed of being too aggressive ,Butch's character has been stained. The amber one just left the kennel and the red one simply went move.